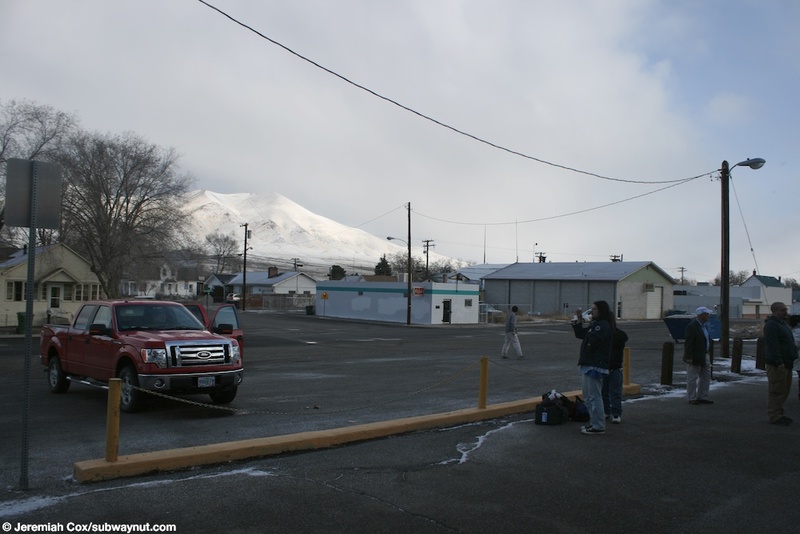 Winnemucca, NV is probably the most remote and small Amshack Station that is a regular smoke stop and crew change stop (the conductors and engineers change) on a long-distance route. 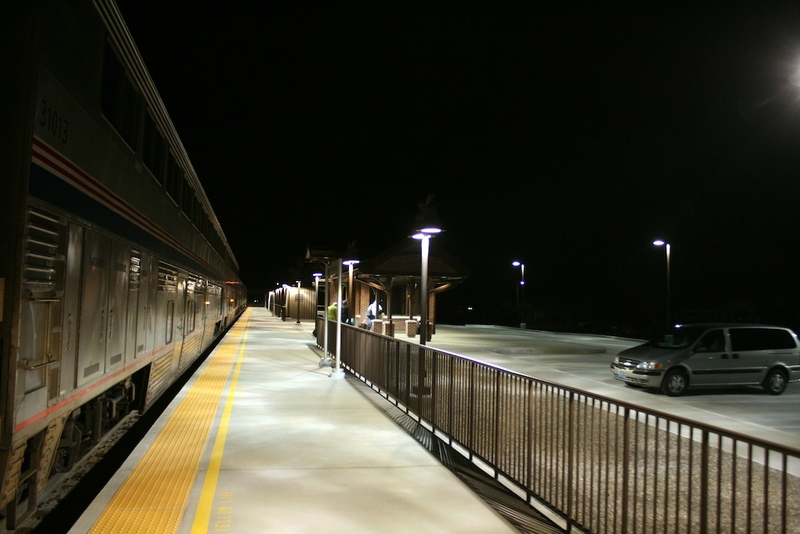 The station's a crew change stop because of the fact that there's no major cities, towns, or even staffed stations between Reno and Salt Lake City, a trip that's scheduled at 10 hours, a bit too close for comfort for the train coming under the 12 hours legal limit that a crew can work. 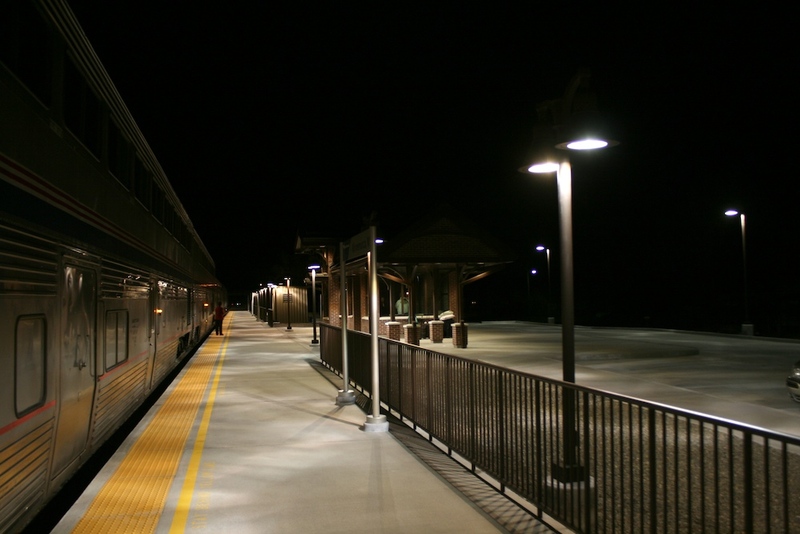 The only other station at all on the route is Elko. 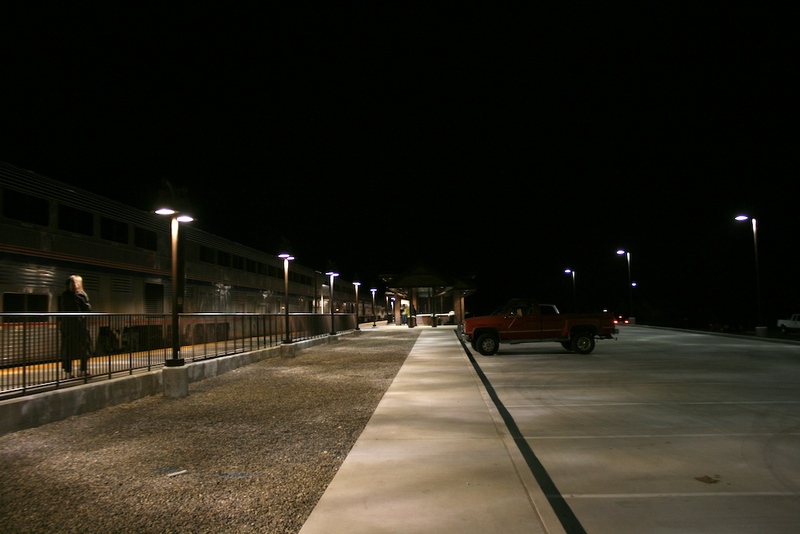 The station consists of a fairly short (maybe two cars can platform, only one door opens for those wanting fresh air), but relatively wide simple asphalt platform, with a simple yellow line painted to keep people away from the track. 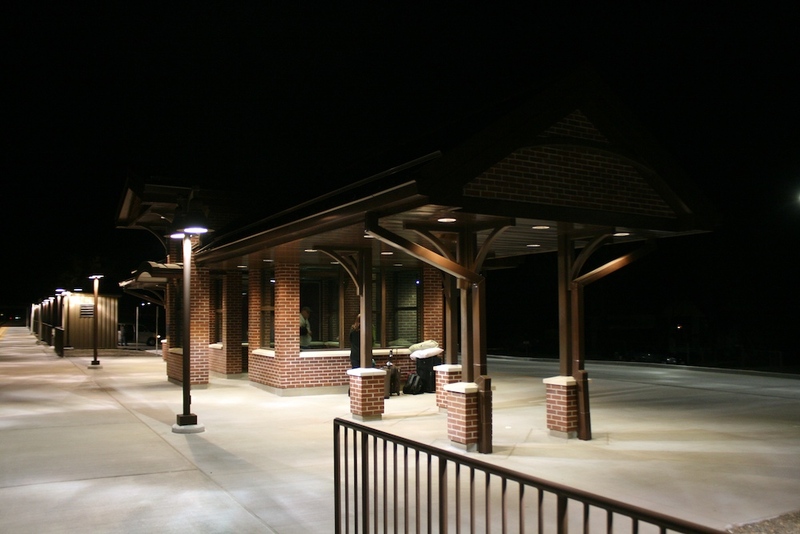 This is alongside a small parking lot, for furniture on the platform there is currently just a simple and small bus type shelter; that does have a bench inside of it. 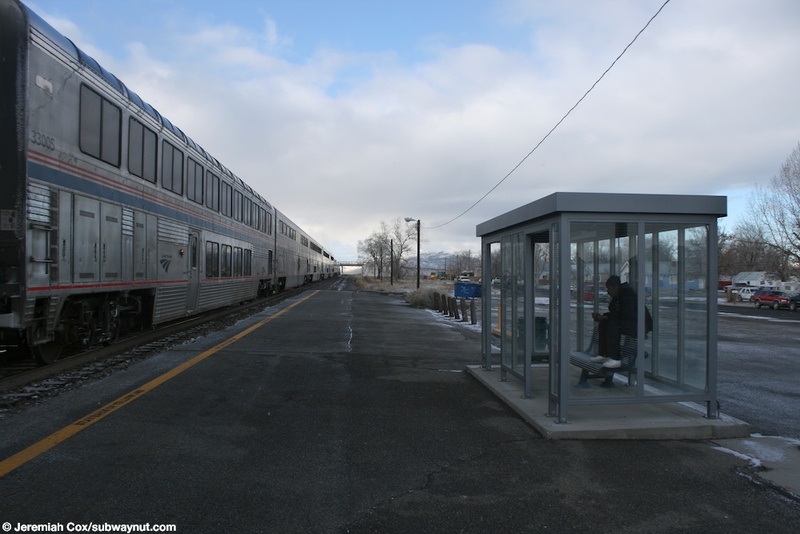 This shelter's and the entire stations only signage is one that says to call or visit Amtrak's Website, and one that is of the California Zephyr's Schedule. 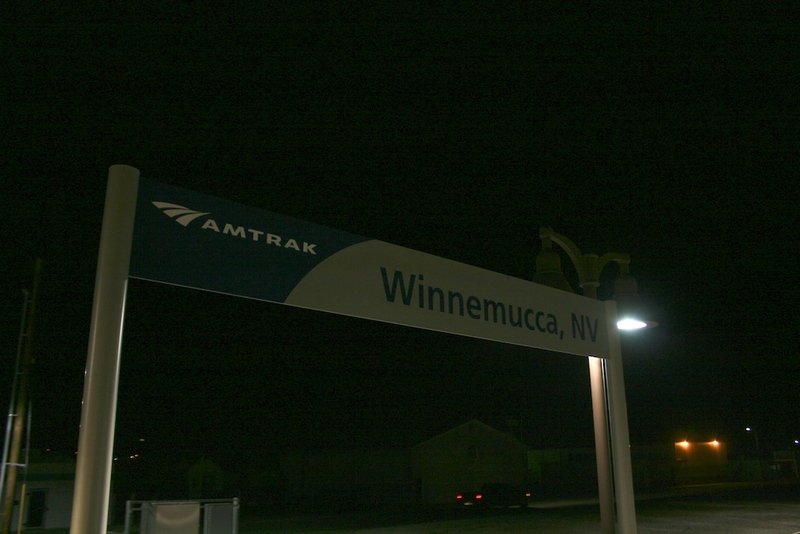 There no signs at the entire simple station that say Winnemucca, NV. Older photos do show that the shelter originally had lettering (probably white stickers) on the shelter. 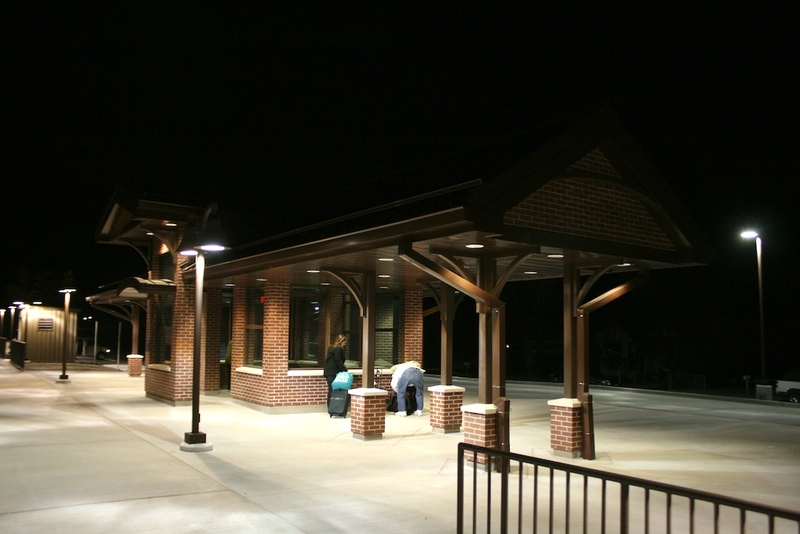 This shelter was installed in 1993. 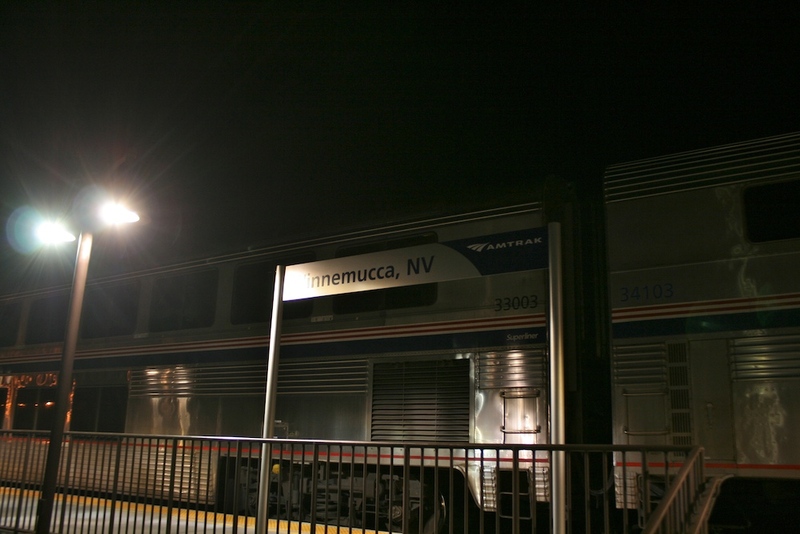 2012: I awoke for the fresh-air stop in Winnemucca while riding the Zephyr and feel like I am in a completely different place. 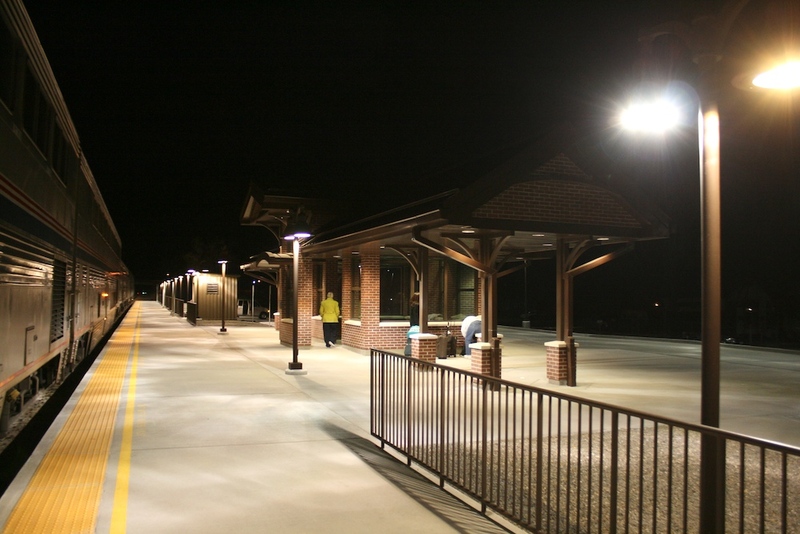 The stop has received a $1.26 million ARRA improvement to make it fully ADA compliant. 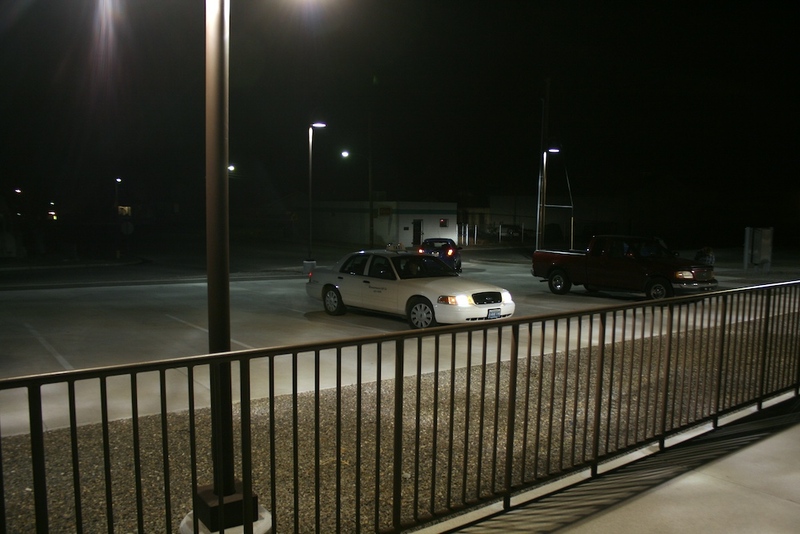 There is now a longer raised platform (no stools required) with a fence and a few steps down as well as a ramp to the small parking lot, and the now required ADA wheelchair lift enclosure. 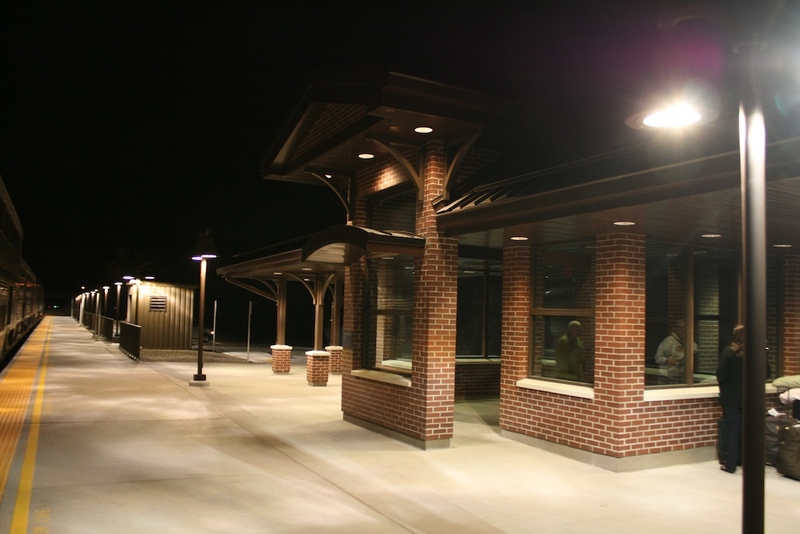 The biggest improvement though is the Amshack has been replaced by a large canopy structure set back from the platform with a central waiting shelter enclosed on most sides by brick walls with windows and benches beneath. There are also now modern station signs that line the platform. 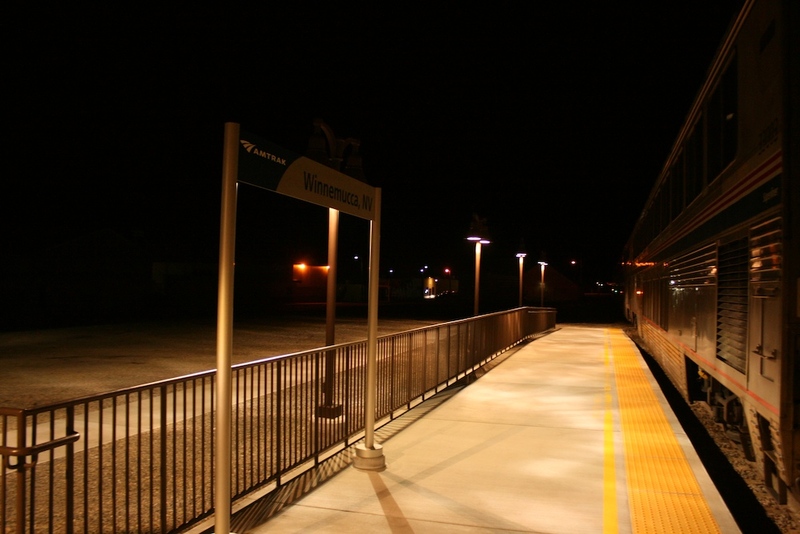 Looking down the simple platform at Winnemucca, NV. 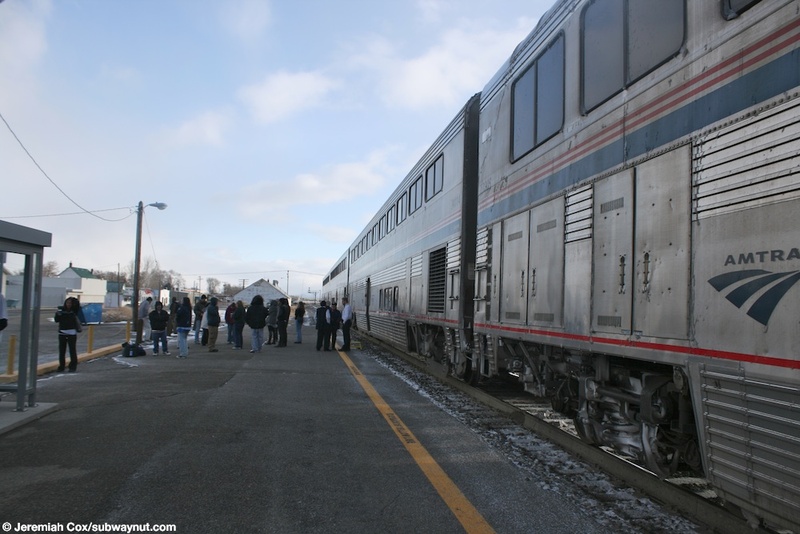 The simple shelter is visible with a passenger smoking in it, also Superliner Sightseer Lounge Car #33005. Looking out towards some houses in the small town of Winnemucca, NV-Population 7,000 from its Amtrak platform. 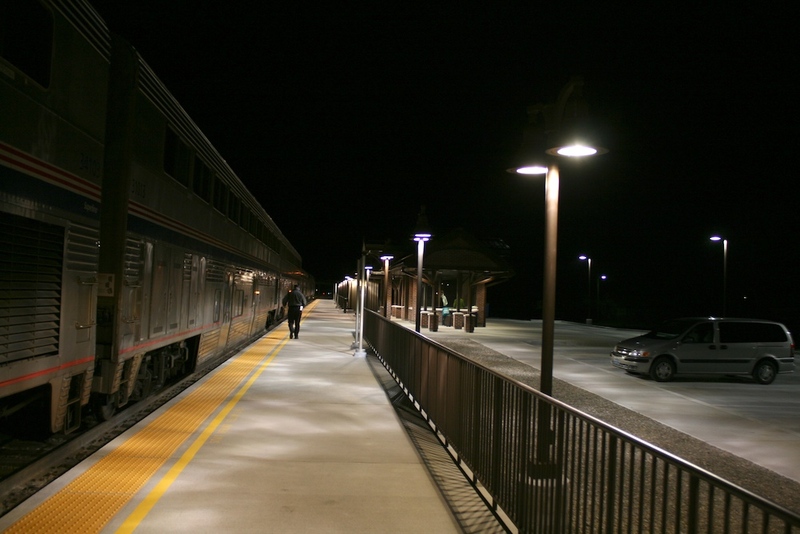 The only two froms of singage on the small platform at Winnemucca. 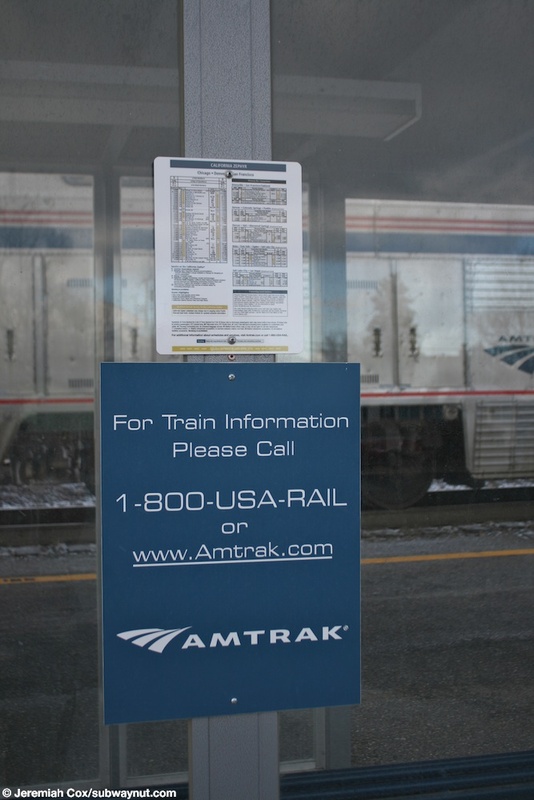 One generic sign saying to call Amtrak (with the new logo) for trian information, the others of the Zephyr's timetable, including it's thruway connections. 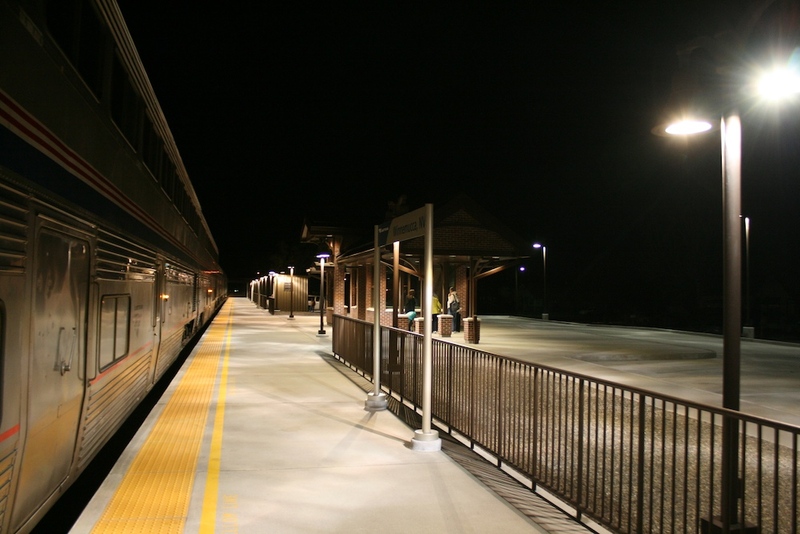 Another view down the platform at Winnemucca looking west, with Sightseer Lounge Car #33005 in view. 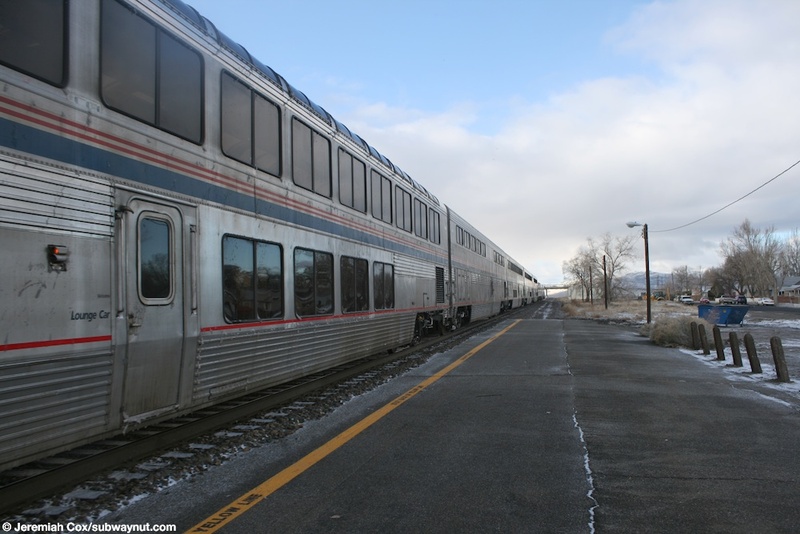 The small crowd of passengers that have decided to detrain from the Zephyr to smoke during its short stop at Winnemucca.